Happy Two Year Henniversary Effie, Eliza and Flora-Jayne! Today has been a day of celebration, presents, party and cake! Misses Effie, Eliza and Flora-Jayne chickens all celebrated two years as free range girls! My E girls arrived in the last big rehoming of barren caged hens. In December 2011, farmers throughout the UK were clearing out their barren cages to comply with the Jan 2012 cage ban. I brought home four poorlies who spent Christmas in the ICU (coalhole). Little Evie enjoyed a few months as a free girl until her beautiful heart finally gave out and our beloved Miss Basket passed away this summer, after eighteen months free ranging with her soulmate, Effie. Eliza weighed almost nothing and her legs were so weak she could not stand up. However, a few days of rest and good food and she was up and about and causing enough mayhem to be allowed to go outside in the hospital coop with Evie. Food became a very Big Thing for Eliza and even now she can be very protective of her food. Understandably, considering she must have been starving in those cages. Very soon into her freedom, she discovered greens and her favourite pastime in the world is to munch on some tasty greens. When she finds other tasty morsels in her daily forages, she makes such a fuss chirping about them that by the time she has finished, someone, usually Flavia, has stolen the morsel from under her beak! She settled in with the Big Girls very quickly and swiftly rose to the rank of Bella’s lady-in-waiting. When we sadly lost Bella, I was a little concerned about Eliza’s ability to be Top Hen but she has risen to the challenge admirably and is now a very good Top Girl. After two years free, she has finally started to lay (?!) 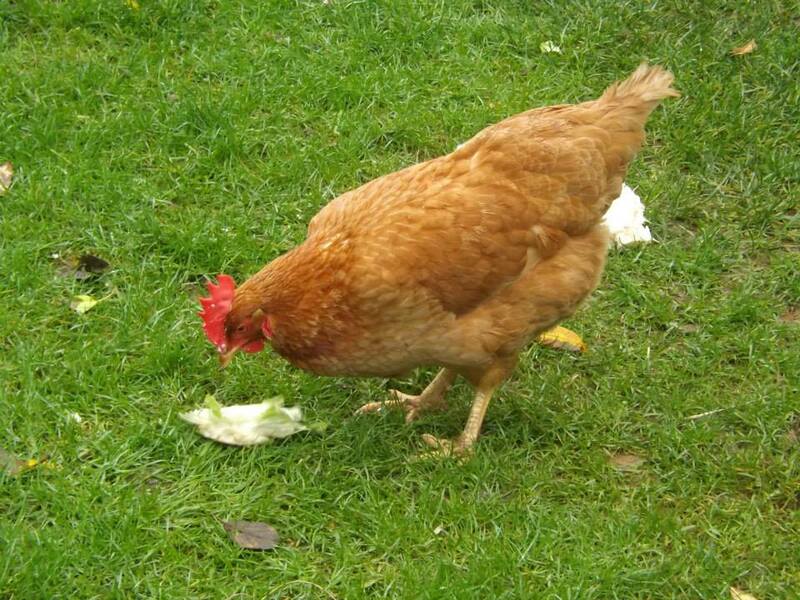 and can be found chirruping away contentedly in the bush by the pond (her secret laying place) laying her morning egg. Eliza enjoys some post cake cauliflower! Flora-Jayne came to live with us only a few weeks ago. She was the last remaining ex-batt of a little flock and needed company. Amazingly, she came from the same rehoming as Effie and Eliza, and it was immediately obvious that she and Eliza remembered each other. Consequently her integration has been very easy! She still sleeps in her own coop (with Effie’s Malcolm) as Gracie Thug is still a bit territorial. However during the day, she free ranges with her new sisters. She is also a very clever girl and got the measure of me very quickly. Every morning I open her coop before the Big Girls’ and she runs after me to the greenhouse where she has a treat of mealworms in peace! And then there is my darling Effie; the little hen with the broken body and the broken spirit who slowly learnt what it was to love and to be loved. As she slowly discovered her new free range life she found a friend, she found a family, she found she had a big brave heart and she found she could lead the life a little hen deserves to live. She has changed my life. Sometimes you connect with a creature, be they human or chicken, as though you were destined to be together. Effie and I are such a pair. She is my special girl and I am her special human. We understand each other, support each other and love each other. When her beloved Miss Basket died, I knew exactly how to mend Effie’s broken heart. And now she runs around her garden with her three bantam babies, who adore their Big Sister Effie, she tucks herself protectively over them at night, she watches over them by day and she shares her treats with them. Effie is a happy girl once more. On the night she arrived to live with me, I did not expect her to last the night, and now, two years later, I still cherish every day with her. She is the most precious of souls, she has changed lives, she has showed the world the traumas hens suffer in cages and she is the most perfect ambassador for her commercial sisters. I do not have the words to describe how much I love this beautiful girl. Today started with a special breakfast for the special girls; each girl having their favourite treat with their mash – Effie had an egg, Eliza had cauliflower leaves and Flora-Jayne had mealworms. 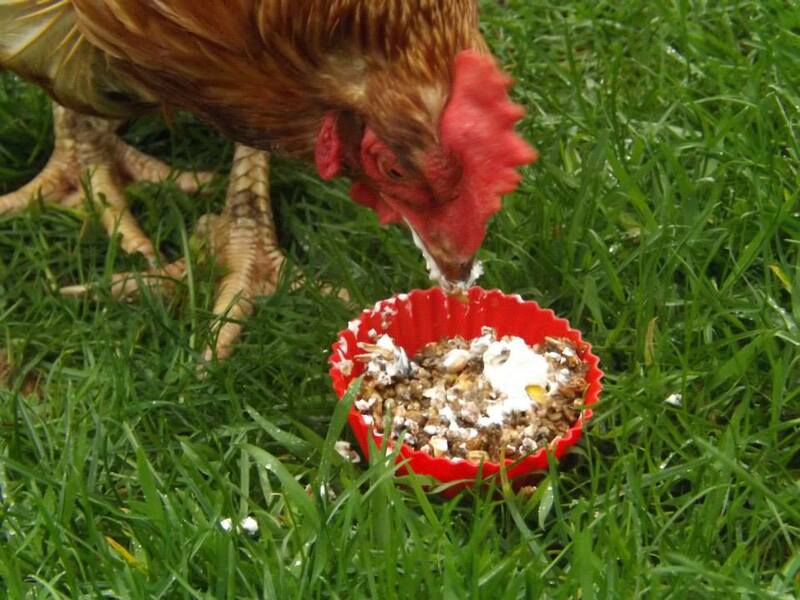 At lunchtime (the humans sneaked home from work for an hour) everybody had mealworm cakes with live yoghurt and sweetcorn topping, posed for photographs and we all sung a rousing chorus of “Happy Henniversary to you…” As befits her superstar status, Effie also had post from her admirers. She had a parcel from her lovely friend Megan which contained mealworms and treats and a card from her good friend Liz which also contained an award; the Effie Cross, awarded ‘for pluck.’ It is given for outstanding bravery and valour. Effie is its inaugural recipient and will wear it with pride. As we are approaching the shortest day, an early night was in order and after the excitement of the day, nobody complained. Flora-Jayne tucked up with Malcolm, Liza is perched over her girls inside Henderlay and Effie is tucked up over her precious bantam babies. Flora Day occurs on or around May 8th in Helston, Cornwall and celebrates the coming of spring with dancing, partying and an abundance of lily of the valley. However, here in Rosewarne, our Flora Day was celebrated today, 27th October, with the greatest storm since 1987 brewing in the skies, the dark winter evenings closing ominously in and rain, the like of which I have never seen before, blowing up the Red River Valley in menacing sheets of blackening doom. But, in spite of all this autumnal ferocity, our Flora Day was alight with sun, happiness and joy (and an egg!). Miss Flora Hen is an ex-batt who, until recently, has lived a very happy post-cage life in Marazion with her three sisters and two loving owners. However, her sisters have sadly all died and Flora was left alone. 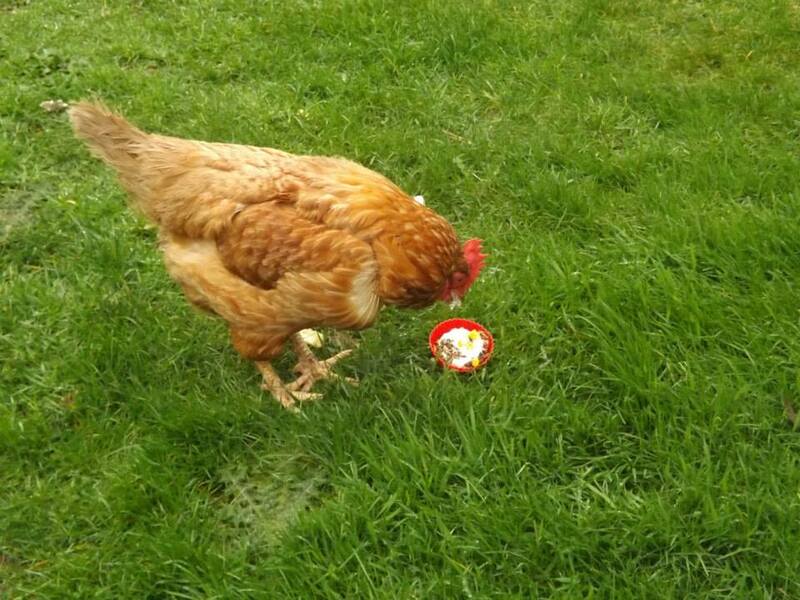 Her owners needed a new home for her so she could have hen company again and become part of another flock. There was a spare coop in our garden and it didn’t take long for Gary to get my (not so) subtle hints and suggest she come to live with us. So today Miss Flora arrived!! Miss Flora-Jayne, a ray of sunshine! After speaking to her, understandably upset, owners, we discovered Flora was part of the same rehoming as Evie, Eliza, Effie and her beloved Miss Basket. This means I may well have taken her out of her cage and it gives me a special affinity with this very pretty little hen. 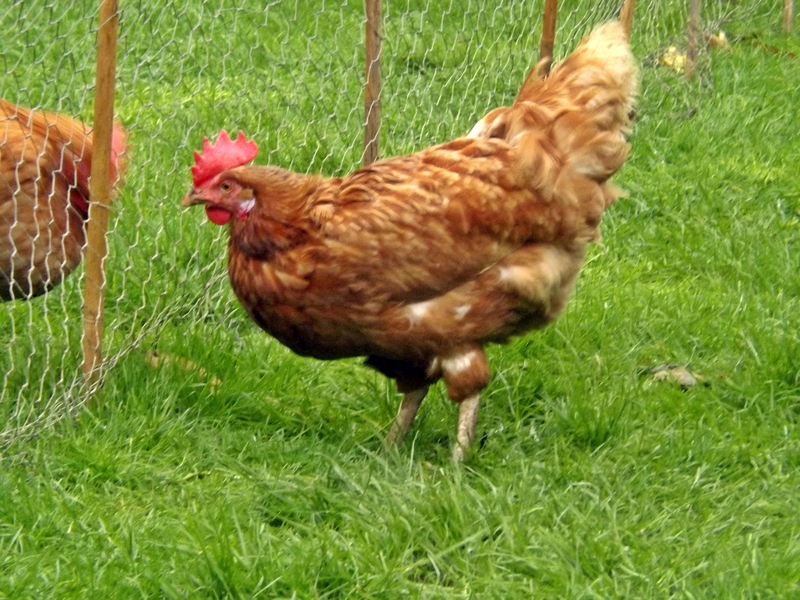 She is now living in the Big Girls’ Garden, in her own coop and run, for a couple of weeks before introductions begin and I am amazed that Eliza ‘Give ‘em All Hell’ Chicken has merely come up to the wire fence and pecked at the grass that Flora is pecking at before wandering off. I know chickens recognise up to 80 other girls and I wonder if my most combative of girls actually already knows who this new hen is. Hens never fail to amaze me with their intelligence, empathy and compassion and I feel that my two remaining E-girls will recognise a fellow ‘survivor’ from their farm and offer her the wing of friendship. But what of her name?? Flora?? Her name needs to begin with a J as fits my little system but a girl of two years free cannot have her name changed!! So we decided Flora-Jayne she would be! And it definitely suits her. So far she had flown onto her coop roof, announced very loudly (and repeatedly) to the world that she is here, had her wing clipped amongst great protestations, shared a fence-limboing tuft of grass with Eliza (they do know each other I am sure of it!!) and laid an egg!! Not bad for a first day! 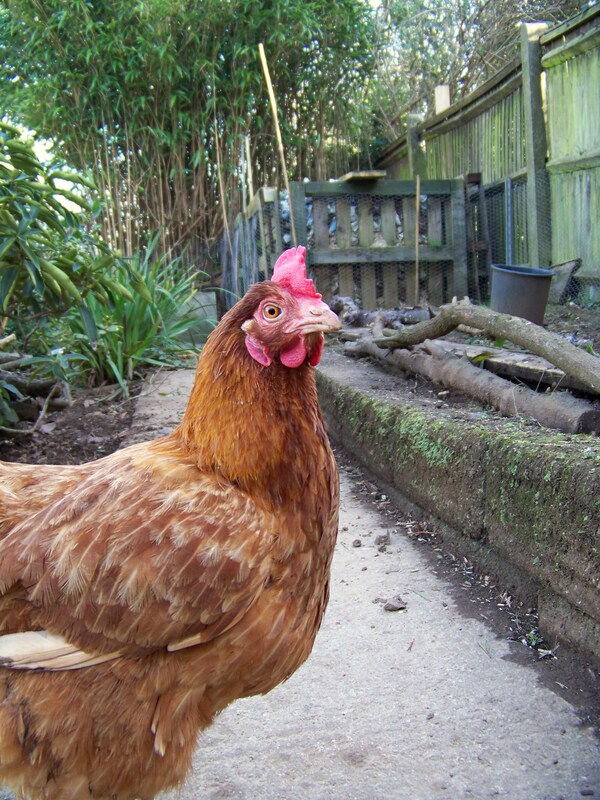 If you are inspired by Flora-Jayne’s story, and you live in Cornwall and feel you can offer a loving home to some ex-commercial hens, I have a rehoming on 14th December in Camborne. 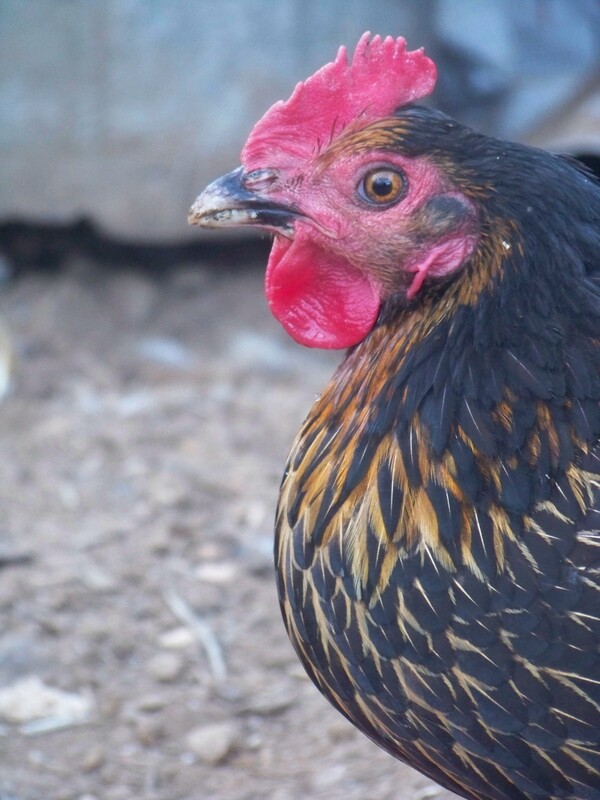 Please visit the website to reserve your hens at www.freshstartforhens.co.uk or if you are tempted but unsure PLEASE email me for advice and information on cornwallgreenbean@tiscali.co.uk. Today my Big Girls shocked and horrified me. There was a monumental skuffle in their garden this morning. They had a very young crow and were pinning it down, taking it in turns to try and tear it to pieces. The crow was terrified and the girls were beyond themselves in a frenzy of blood lust. Much screaming and thwacking of the girls with a towel by me and they were brought back into hen mode and released the baby. He limped off into the undergrowth, unable to fly. I know all too well how cruel hens can be to each other and I have seen them with a mouse, but this was something so beyond horrific that I am still having trouble believing my girls were capable of it. Left alone they would have pulled this screaming baby apart. Effie in the adjoining garden was most distressed and inconsolable. I can only imagine that it brought back the horrors of the cage to her. What was happening was traumatic in the extreme, imagine it in a cage, magnified a hundred times. Imagine the pain and terror of a hen set upon by others who were hellbent on killing her, tearing her to pieces. Nowhere to escape and no hope of a saviour. I have little doubt my Effie witnessed this and experienced the fear that she was next. It goes much of the way to explain her emotional problems. I found the baby crow cowering behind a rock in the garden. I am not a massive fan of crows, but one look at the fear in his eyes, pleading me to help him and I had no choice. I will never forget his face, I heard his voice as clearly as if he had spoken to me. He spent the day in a cat box in a spare room, eating cat food and drinking plenty of water. The local wildlife centre said to have him checked with the vets and then referred if necessary. By the afternoon he was much improved, still not 100% on the flying side of things but much more mobile with no signs of serious injuries. The vet has taken him for a day or two to rest and complete his recovery, before he will be put in an open top run so he can fly away when he feels strong enough. She confirmed he was a newly fledged baby. What a baptism of fire into the horrors of this world. I have had words with my Big Girls and there is a very subdued atmosphere in the garden today. Happy One Year Henniversary E Girls!! One year ago today, four very, very special girls came into my life. Rescued last Christmas as part of the big rehoming with the battery cage ban coming into force, four poorlie girls who needed extra love and care came home with me. We quickly fashioned the old coal hole in the utility room into an ICU and tucked them up for their first night as free girls; the lucky ones who had a chance of a new life. There was little Evie Lou with a swollen belly, limpy girl Eliza who weighed next to nothing, Miss Basket with a blackened and infected foot, so bad she had no feeling in it or ability to control it and the saddest soul of all – Effie, a little hen with a broken body and a broken spirit. All four girls spent Christmas in the ICU, having round the clock care. There is nothing lovelier than being greeted first thing in the morning by the gentle bwarks of four little hens. Within two weeks Eliza and Evie had moved outside to the hospital coop; only a few weeks later they were successfully merged with the big girls. Arnica rubs had healed Eliza’s limp and she made up for her initial fragility by eating for England and blossoming in every way. Little Evie Lou responded so well initially that we thought we had beaten her ailments, however tragically she succumbed within a couple of months to the water belly that was swelling her poor abdomen. Despite draining and medication we could not save our poor girl and she passed away in March. The only consolation is that she had a few free range weeks, full of love. Miss Basket (really called Eleanor) spent her first few days in a pink laundry basket as with her blackened foot she was unable to walk. As I tucked her up each evening in a blanket, she bwarked her thanks to me. At one point we feared she may lose her foot but with salt baths and arnica rubs and gentle exercise, she recovered so well you can only see her limp if she runs. Her foot still flicks out lifelessly in front of her but she copes so very well. And then there was Effie – the most vulnerable of vulnerable girls. She proved to be much more of a long term challenge. 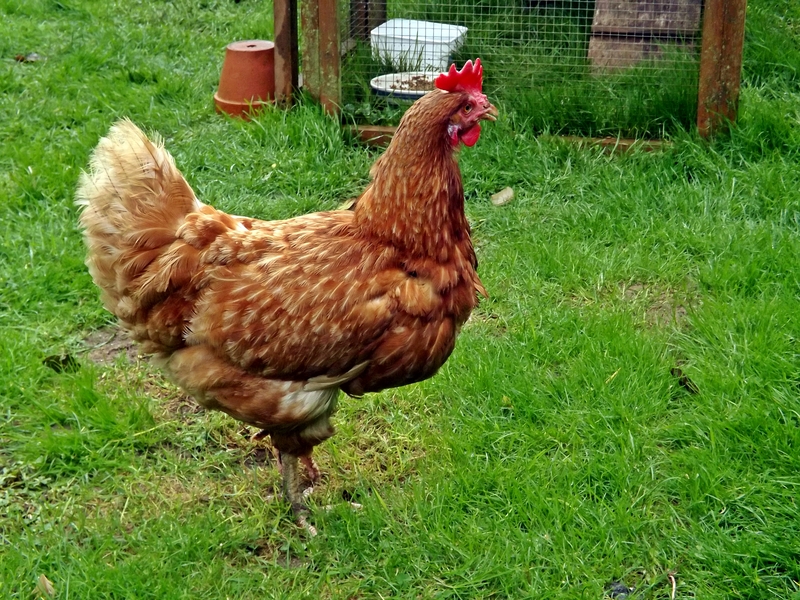 As a sick hen – with her little neck set at right angles (either a birth defect or an injury) – she was a target for other hens and had spent her life being attacked and bullied, having to fight for survival and she was traumatised physically and mentally. In the gentle soul that is Miss Basket though she found a friend. The only hen in her life who did not pick on her. 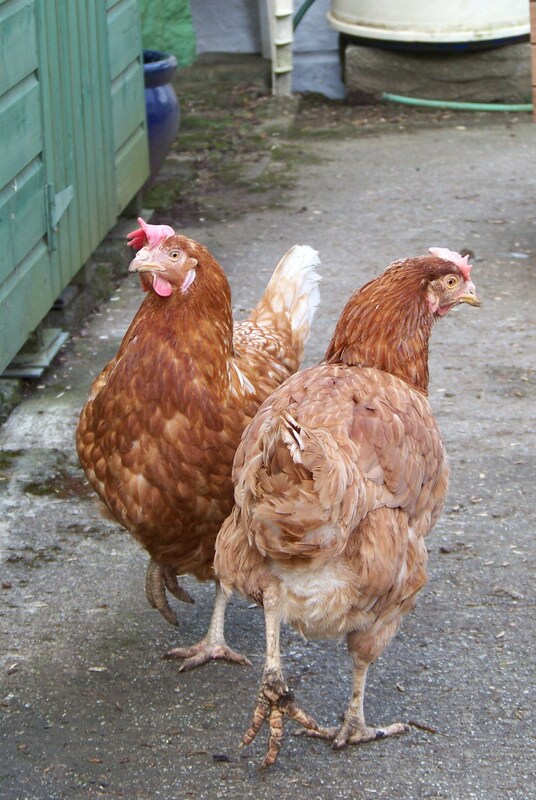 These two girls quickly formed a touching friendship and after many months of love and care, were moved outside into their own special coop and run. 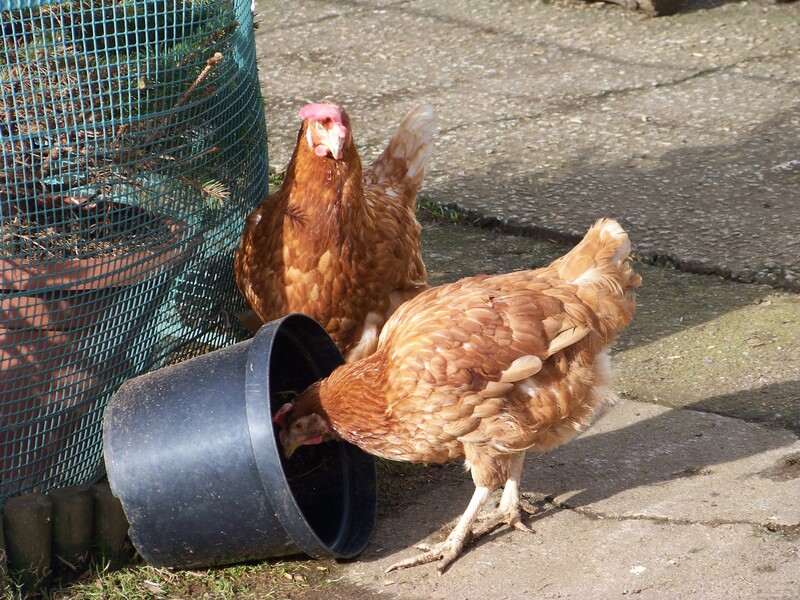 Such is Effie’s trauma she is unable to mix with other hens but these two special girls have recently moved from their run into their own part of the garden – a huge space for two little hens!! Effie and Miss basket enjoy their cake! It has been a long journey so today was a cause for much celebration!! One whole year free! The day started with a special breakfast of layers mash with eggy topping and an early morning chorus of Happy Henniversary to you…After we had said a few words at Evie’s grave the girls enjoyed some delicious homemade cakes, some sweetcorn, a quick game of fatball football and then they opened their present and card sent by Effie’s special friend Liz. It was a splendid day all round! All of my girls are so special but I must save the final mention for my precious Effie. To me, with her hunched little body and Poirotesque waddle she is truly beautiful. Her inextinguishable spirit has overcome all her emotional and physical problems, she has learnt to trust, she has learnt what is to be loved, she knows what it is to be a free range girl and perhaps most importantly she has found a friend in the darling Miss Basket. She is an inspiration to all who read about her and meet her and I am blessed she chose to spend her life with me. Health, Friendship, Coops and a Smallholder Covergirl! Recently this blog has been about such sad events, that to lift our spirits and coincide with spring introducing new life I am celebrating some wonderful and positive news about my girls! Health, friendship, a new coop and a Smallholder magazine covergirl! My ten girls are all healthy and happy and enjoying the spring sunshine. Seeing them stretching out those newly feathered wings in glorious delight to catch the sun’s springtime warmth makes you truly appreciate that every day free ranging is a blessing and we must cherish every moment, just as our girls do. Flavia and Eliza are now pretty much fully integrated with the Big Girls – Bunty Goodchicken was even cleaning Flavia’s beak tonight, bless her gentle soul. All eight girls are spending their first night together in Henderlay this evening and are currently tucked up together in perfect harmony! An early start in the morning to check on them though! People who have chickens are truly amazing and by the power of the internet and social media we are able to ‘speak’ to and connect with fellow chicken lovers across the globe. These people become friends and confidantes as they are privy to our thoughts and feelings, often much more so than people we interact with daily in the real world. Sometimes we are lucky enough to encounter our online friends in the flesh so it was wonderful to meet the lovely Jan and her family today. Meeting people you have talked to online is always like catching up with old friends – you have already shared so much – and like any proud parent I am always delighted to show off my girls. 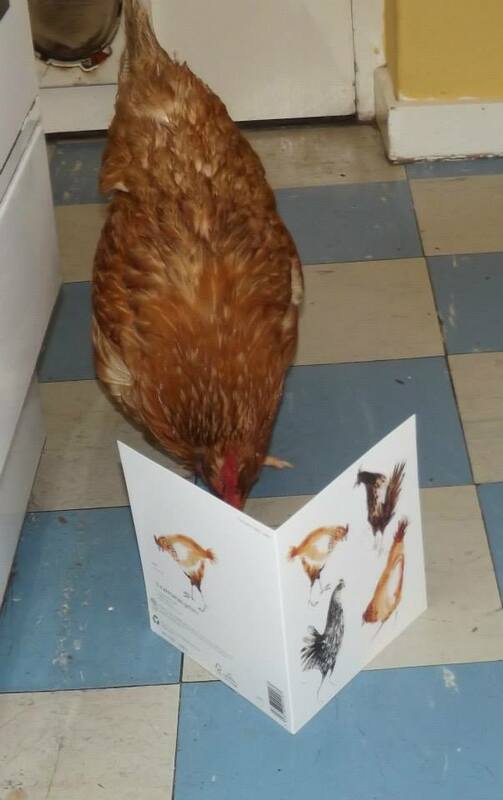 Jan was kind enough to bring me two beautiful cards with chickens on – as a fellow chicken lover she knew how much I would appreciate them! 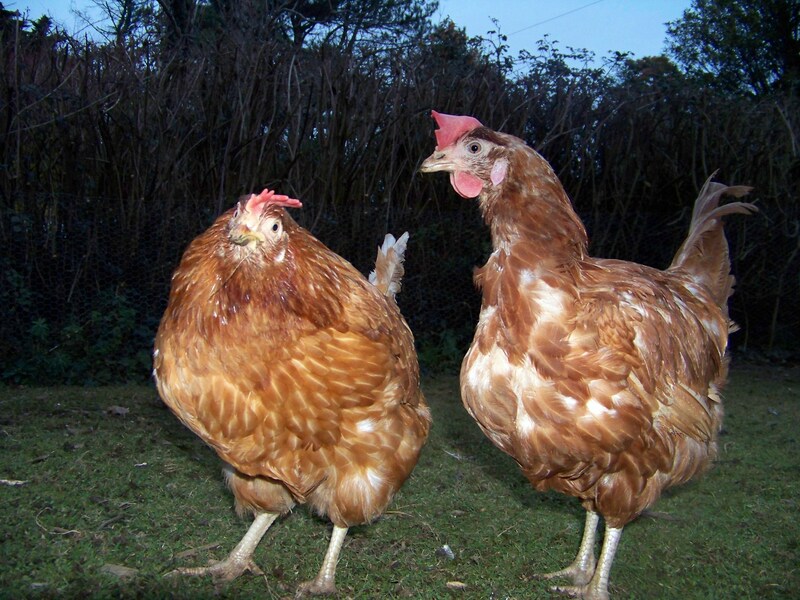 Next week, another online chicken chum, Paula, is heading down to Cornwall and I am looking forward to more chicken chat and yes…showing off my girls again!! So just as day follows night and spring follows winter, from the ashes of sadness and loss, new, tender joyful beginnings emerge. We are celebrating all that is new, alive and exciting whilst still holding those dear departed close to our hearts. When you are rescuing 700 hens, it takes a very special girl to be singled out. That girl was Evie. In the massive Cornwall rescue just before the cage ban came into force, my son Tom came to help us and he noticed one pale little hen, cowering and hunched, her newly emerging quills pecked out and bleeding. She was barely moving. So he whisked her up in his arms and decided we had to take her home. At that moment she became his special girl. Evie spent the next week being attended to by Tom in the ICU wing at our house (the utility room by any other name) with her new sisters Effie, Eleanor and Eliza. There was something rather lovely about having four expectant little faces greeting you in the morning. After a week or so of intensive care, Evie and Eliza were deemed well enough to graduate to the hospital coop in the garden. 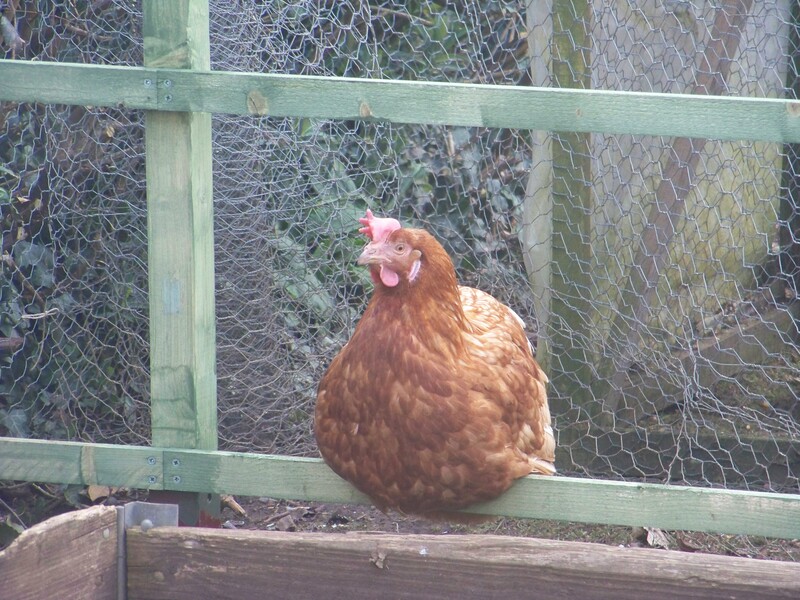 They had their own large run, dustbath and perches but Evie was always happiest perching on the edge of the open door of their coop. It was almost as if she was sitting back and surveying her new life and taking it all in. 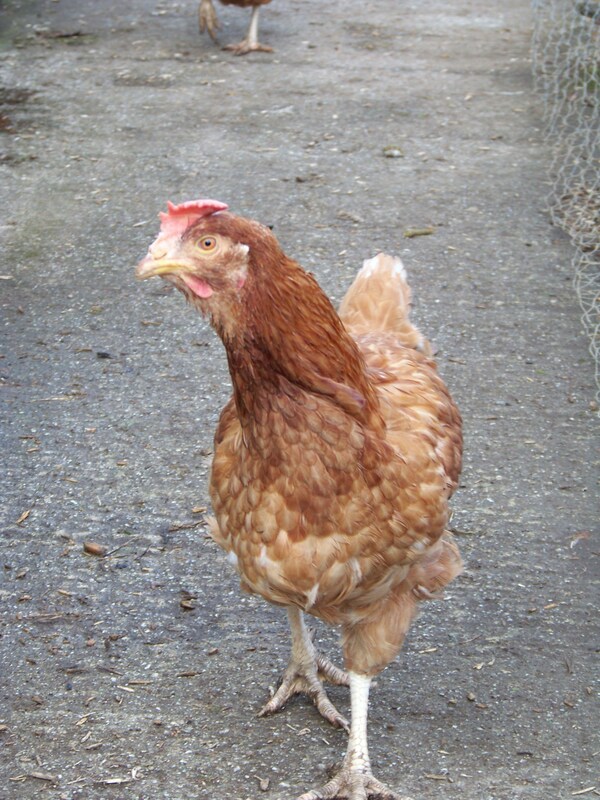 Once she had no-one pecking her, her feathers grew back quickly and were so beautiful – creamy brown with laced edges. Her comb stayed floppy though but it rather suited her! Once they had settled into their new coop they were allowed out for evening jaunts around the garden once the Big Girls had been locked in their run. Here they met Effie and Eleanor again who were also allowed out for an evening constitutional. It became a lovely little ritual as all four girls were getting better. 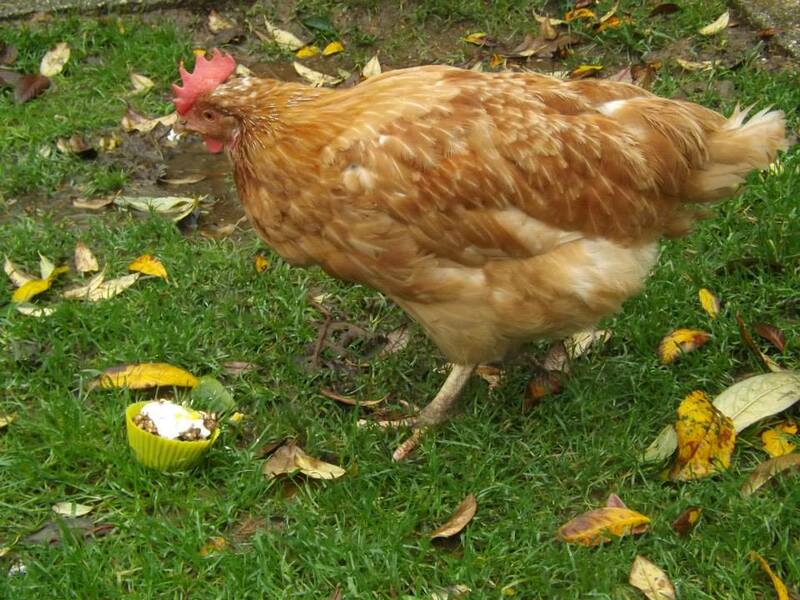 Within weeks, Evie and Eliza were free ranging in the day with the Big Girls but in their own coop at night. They always stayed together though and when Effie and Eleanor were moved outside into a run, Evie and Eliza used to sit on the other side of the fence to them and ‘chat’ – like a true flock, they remembered their old friends. But the reason we brought Evie home was that there was something not quite right, all was not well I just couldn’t put my finger on it. But then the pieces started to fit together – her lack of eggs, her constant perching and sleeping all day, her increasing weight and odd gait. On giving her a thorough once over I discovered her abdomen was full of fluid. This water belly, or ascites, is basically a circulatory problem that would probably be fatal at some point. The immediate treatment was for a vet to drain the fluid to make her more comfortable. On the day of Evie’s operation, Eliza was completely lost and spent the day sitting outside Effie and Eleanor’s run. They stayed close to her all day. Evie the Brave Girl returned and at first all was well. She seemed more comfortable and active and had a healthy appetite. She was prescribed heart pills for the rest of her life, however long that would be, as well as diuretics. We knew anything we did would only prolong the inevitable but really didn’t expect the end to come so quickly. Less than two weeks after her op, Evie started to look unwell, her comb pale and she stood around, hunched and listless. Feeling her crop I could find nothing untoward but on feeling her tummy all was firm and as it should be! At least we had made her more comfortable. By Saturday I think we knew what to expect and all I could really do was give her painkillers so she was comfy. And, indeed her tired little heart finally gave out on Sunday morning. Just because we expected it didn’t make it any less heartbreaking. Evie only had three months of freedom compared to 18 miserable months in her hellish cage. Poor girl, she missed the summer and she did love the sun so. But we had watched her sunbathe and preen and dustbathe and forage. In her short time of freedom she had been a happy hen. She did however know love, kindness, freedom and friendship. And she was a good, sweet, loving little chicken with a big and beautiful, but ultimately weak heart. Her spirit has flown to henven now where I hope she can fly forever free and without pain. There is a very special mother hen, called Agatha, waiting there for her and I know she will take great, great care of our precious little Evie. Fly high little hen. Three months with you was nowhere near enough.